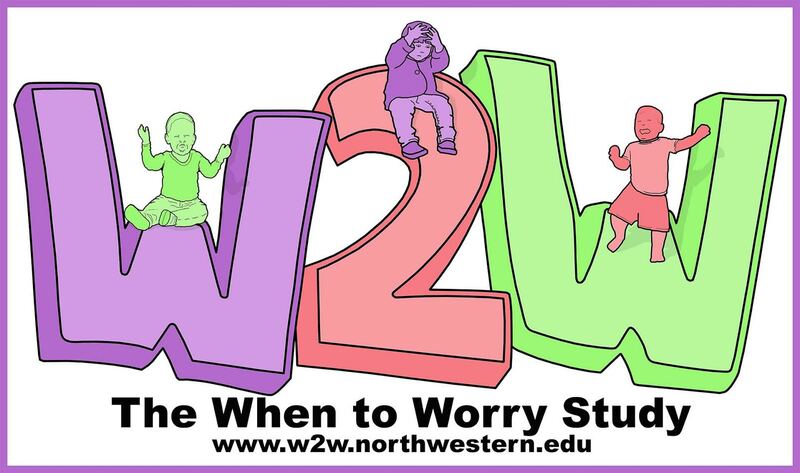 The When To Worry (W2W) Study is all about how different young children grow and learn to manage their emotions. As children develop and learn new skills, they often get frustrated when things don’t go their way. We know this as the “terrible twos” – for example fussiness or tantrums. For most young children, these behaviors are typical in early childhood. Some children struggle with these behaviors a lot and this can disrupt learning and family life. The goal of the W2W study is to identify early signs to help us know when young children need more support to manage their mood and behavior. If you are participating in the W2W Study, you are part of a community of 350 other W2W families! We will invite you to come into our offices on the Chicago Campus of Northwestern University with your baby around the time of his/her 1st, 2nd, and 3rd birthdays. These offices have child-friendly rooms and are set up to be comfortable for parents and children alike. During visits, our friendly team will complete a variety of activities with you and your child that will offer insight into how children learn, problem solve and manage their emotions. We will also ask your some questions about your child’s development, and try to learn more about what a typical day in your family is like. In between these visits, you will also complete some activities at home every two months. These activities will include surveys about home life and child development, as well as a LENA Pro recorder activity. At this age, children grow so rapidly, so these different activities help us to track development and learning in between our visits. You can learn more about the surveys and the LENA Pro activity by clicking the banner above! At your first visit at our offices, our team will give you much more information about all of these activities and answer any questions you may have. You can also reach out to us at any time using the “Contact Us” tab, or by emailing w2w@northwestern.edu, or calling or texting a member of our team on 872-225-2929. This research study is being conducted at Northwestern University under the oversight of P.I. Dr. Lauren S Wakschlag. The study has been approved by an Institutional Review Board (IRB) (STU00202880).